Please refer to our stock # 1988 when inquiring. his is a doll quilt with knotted and tied quilting with cotton filling. It is a warm brown and tan color. It has a stain on the under side that looks like rust. It has no rips or tears. It is 15" by 17" and is circa 1890-1900. 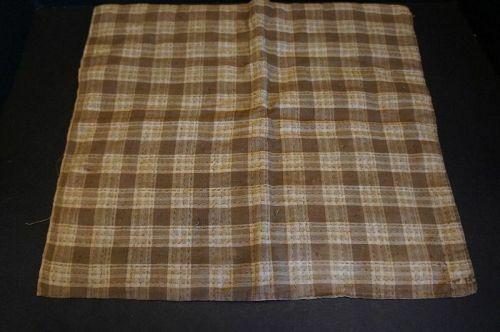 22" by 15"' 19th C. quilted blue and brown calico pillow case Antique cloth covered book brown calico fabric Big heavy brown and blue antique calico pin cushion 7" x 7"